Be informed! The 3rd Street Bridge/Dam Public Hearing is Thursday, 10/13. If you care about the design of the bridge/dam and its impact on Glen Providence Park, this is your opportunity to voice your opinion and ask questions! Take 15 minutes and educate yourself! 1- Read our Guide to the Bridge/Dam documents that are posted on the Borough website. 2- Read our 3rd Street Bridge/Dam updates from the Borough’s 3rd Street Bridge/Dam Committee meeting on August 23. 3- Read this condensed 4 page version of the 18 pages of Q&A from the engineers, from our July 31 and August 9 lists of questions and the August 3 Special Meeting. This is a selection of the project engineers’ written answers to questions we submitted to them about the 3rd Street Bridge/Dam. The original location of the answers is notated by the date of the question and the page where the answer is found, for example: (7/31 p. 2). Review these answers and see what follow-up questions they raise for you! Q: What can be done to reduce the physical footprint of this dam? Q: Can there be stone facing in the final design, on both sides of the dam? Q: Can we request that the replacement fence for the swim club be in keeping with the design? Is barbed wire necessary? Q: What kind of plantings can be done on a downstream dam wall, in addition to grasses? Q: What type of fence is proposed directly above the outlet? Q: Can we ban vehicular traffic and create a “greenway” designed exclusively for foot and bike traffic? This would sustain current low levels of air and noise pollution at Glen Providence Park. A: Although PennDOT Guidelines do not preclude removal of the vehicular bridge and replacement with a pedestrian greenway, the decision to reconstruct the dam and roadway was made in 1998 in conjunction with securing funding for the project. 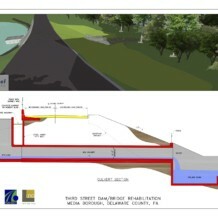 In addition, the recent legal agreement among Media Borough, Delaware County, and Broomalls Swim Club requires reconstruction of the roadway on top of the dam. (7/31 p. 2) Note: we believe the wording of the legal agreement allows for a pedestrian/bicycle greenway with emergency vehicle access. Q: Could the road be made one-way into Borough, both reducing the width of the dam, and minimizing traffic and noise? Q: Can we eliminate the parking lane, and replace it with a bike lane and sidewalk? Q: Could we connect a bridge sidewalk on the Upper Providence side of the bridge with a trail entering Glen Providence Park? That trail could then lead to the Kirk Lane park entrance, and connect with the planned greenway in Upper Providence. See our 3rd Street Bridge/Dam updates from the Borough’s 3rd Street Bridge/Dam Committee meeting on August 23. Q: What will keep the fertilizer (listed in the Safety Review Plans) from destroying the High Water Quality designation of Broomall’s Run and Ridley Creek? Q: At what water level will the lake be maintained during construction? How will you minimize and monitor the impact to the lake’s wildlife and to the park’s wetlands? Q: Will the park be accessible from this entrance during construction? Q: What will be the access route for construction vehicles to the base of the dam? Q: Where will the construction vehicles be parked during the construction phase? Q: We request a one-to-one replacement of every tree (over 10’ tall) that is taken down in the project. We request native trees of at least 8′ be planted. We would prefer they be planted along the new entrance and walkway to the park – to restore the wooded feel to the entrance. Q: Additionally, a tradeoff for wetlands impacted at the park for wetlands elsewhere is not acceptable. A: Wetland mitigation locations have not been determined. A possible mitigation site is the pond area within Glen Providence Park. However, it should be noted that construction vehicles and associated access roads to the pond will affect additional areas of the park. (8/9 p. 4) Note: the main sledding hill is already used for maintenance vehicle access. Q: What exactly are PennDOT’s and the DEP’s standards or guidelines for public input in projects such as this? Our additional questions about the review process: when in the design process will the Environmental Documentation be submitted? And, can we be informed when the Environmental Documentation is submitted to the PADEP? Q: Why weren’t [the 2011 Color Plans & Simulations] provided to the public for input? A: The plans were presented at the public meeting for comment. (7/31 p. 6) Clarification: These questions were submitted on July 31, before the August 3 public meeting. We did not receive these answers until September. So… there are more answers in the three sets of Q&A- consider reading through all three lists of answers! But note that if you read them chronologically, you may find yourself confused. The 7/31 questions were the first submitted, but the last answered. They have updated information that is sometimes different than earlier answers. Still have questions? Good! Write them down and bring them to the public hearing on October 13! We will continue to update this summary with information and clarification.